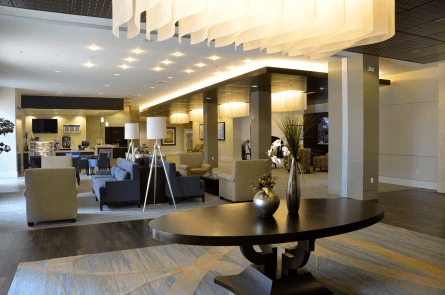 A new, luxury senior living community opened its doors for a sneak peek Tuesday in preparation of its grand-opening next week. Located in Costa near Newport Beach, Vivante on the Coast boasts a long list of amenities including a fitness center, indoor saltwater pool, hair salon, theater, dog park, upscale restaurant, putting green, cocktail lounge, library and even a fun zone for the grand kids. There is also a 24 hours a day,7 days a week concierge service, chauffeur service, pet care, personal shopping, technical support and each resident is given an iPad. Vivante's official grand opening it slated for Tuesday, Oct. 15. The $62 million, 185-unit retirement community is built on seven acres. So far Vivante has about 75 committed residents ranging in age from 63 to 90. Alder said Vivante is located close to Hoag Hospital, and is expected to offer older retirees in Newport Beach a great place to live. Vivante officials said its goal is to simplify life for its residents, and also focus on helping them enjoy life. Vivante's suites are spacious with six floor plans ranging from 450 to 1,800 square-feet, each with stainless steel appliances, solid wood cabinetry, washer/dryer, outdoor patios, walk in closets and large bathrooms. There are 185 total residences, 40 are independent living, 145 are assisted living and 40 are part of the Secure Memory Care Facility created specifically for people with Alzheimer's and dementia. Vivante on the Coast is located at 1640 Monrovia in Costa Mesa. For more information call the Vivante office at 949-629-2100, or visit vivanteliving.com.